Welcome to Refugee Friday! Today is the NINTH installment of Refugee Friday. Every Friday, through the end of the year, we're partnering with Preemptive Love to share the stories of refugee survivors across Syria and Iraq. Along with giving these survivors a voice to share their story, 50% of orders placed on Refugee Friday will go to Preemptive Love to contribute aid and relief efforts, but ultimately, to restoring dignity after desolation. Dilagash’s name means “bright heart.” He was very young when he was diagnosed with a degenerative eye disease. His vision is nearly entirely gone in one of his eyes and is fading in the other. Darkness, holding toys close to his face, feeling his way around a room—this is Dilgash’s normal. Steadily fading eyesight hasn’t been easy, but he is used to it. In fact, he didn’t seem to realize it was unusual until his younger brother started school. Dilgash stayed home. When the family fled Iraq, they started their lives again in a new refugee camp with fears of how their son could possibly find life, losing his vision in a fenced-in, barbed-wired fence camp? While Dilagash’s other siblings went to school in the camp, he stayed at home with his mother. They were told his condition could never be treated—he would have to leave the country. Around that time, Dilagash’s family heard about a safe space in the camp that the staff called “The Friendly Space.” The staff is especially trained in social work and childhood development to help children like Dilagash who can’t attend other schools. This bright-hearted boy now has a place where he can be a kid again. He can join his brother and friends in a classroom setting, play games, learn arts and crafts and learn language at the safe space. This Friday, 50 percent of proceeds go to creating a healthy, safe space for refugee children like Dilagash. You’re invited to offer a space where no child is forgotten or a lost cause. Parents can find relief in knowing their child is loved and growing under the care of trained staff. 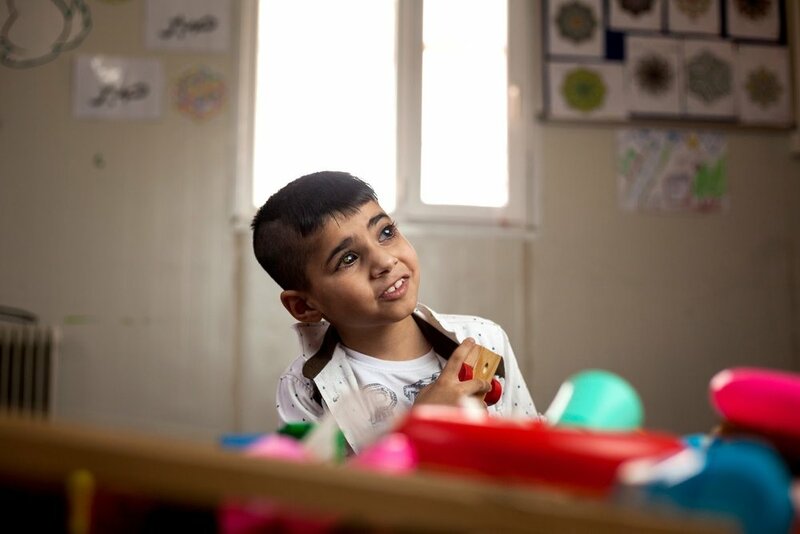 Helping children heal safely and with dignity from the trauma of war.